No sign of the mouse yet……………..maybe Bubba is delusional. Anyway, will leave the trap out and see what happens. 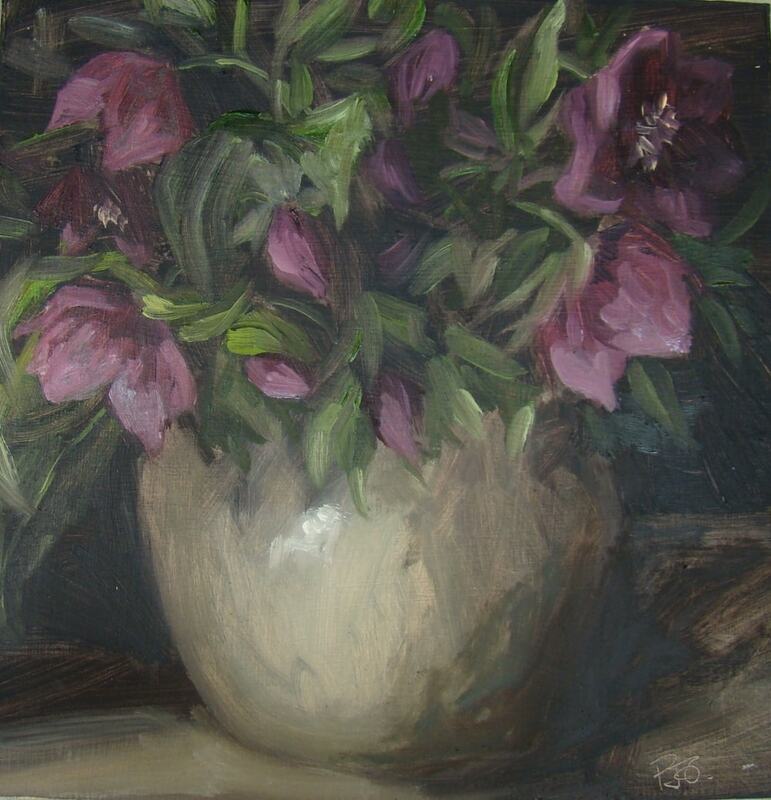 I have been working on a large painting today but here is another of the hellebores that I did in a marathon session……… they don’t last long before drooping. I had two buyers for yesterday’s so this one is off to the person who missed out. I’m hoping I haven’t depleted my friend’s entire stock and she might let me have some more. Haha! The trap is set. Let’s hope that pesky mouse is fooled before he starts chewing away at my canvases. An interesting day today. I had a visitor to my studio today – a film-maker who wanted to make a short (1 min) film about my daily painting project. I don’t think I’ll be up for an Oscar but it was fun (sitting in a chair mostly, rambling on). I will, of course, share it with you once I’ve seen the finished article and checked that a) I don’t look a hundred and b) I don’t sound demented! These lovely dark hellebores were, once again, snaffled from Sarah’s garden. Snowdrops brought to me by my sister-in-law from her lovely Oxfordshire garden. Last night I watched Yotam Ottolenghi’s cookery programme that I’d recorded………mmm. My favourite cuisine is Middle-Eastern. Although this was Moroccan food, it’s fairly close in flavour. One of the best meals I’ve ever had was in Marrakesh but can’t remember the name of the restaurant now! All that colour is very inspiring. Maybe I’ll paint a tagine! Bubba was very agitated in the studio this morning, sniffing around and poking his nose in between my canvases which leads me to suspect a mouse………horror, they enjoy a diet of canvas – must get a trap. 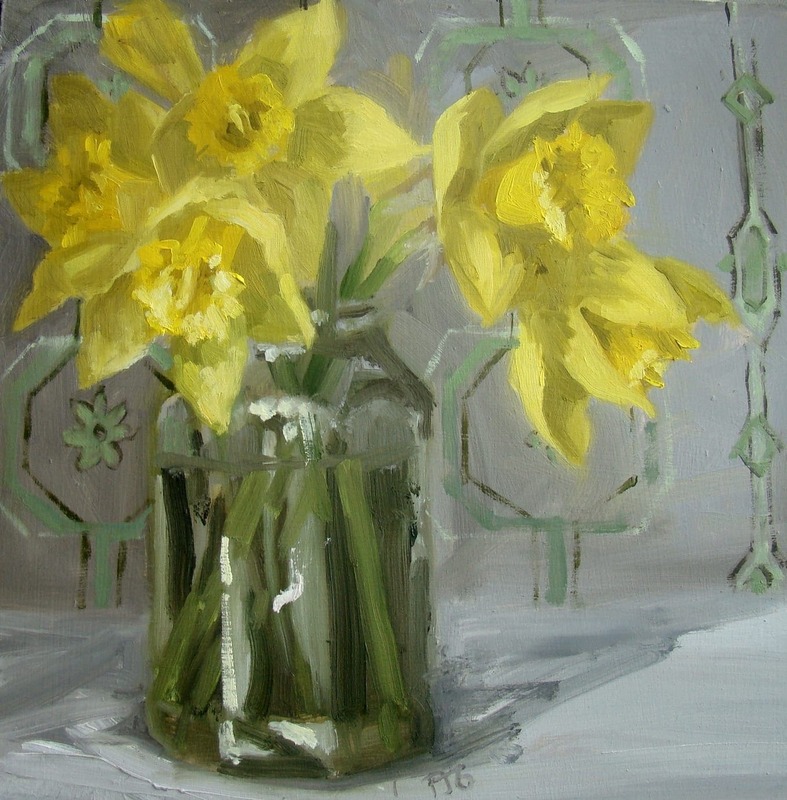 Back to daffs for today as I rejigged this to include some wallpaper which, in the flesh is not as wonky as my poor photography portrays! I’ve been hard at it all day and now I’m going to have a cup of tea and take myself off to Pilates to work the muscles that never get a look in when I’m standing at an easel. Not that they do at any other time either! A bit of a rest from snowdrops but not for long……… I spent a fair few hours earlier prepping boards ready for painting which involves a complete takover of the kitchen. I had about two hundred cut for me by the nice chap on the timber-cutting desk at B&Q. Now I have to give them a coat of primer followed by several coats of gesso……very time-consuming. I was in the studio later than usual today as I got entrenched in watching Show Me the Monet, which, in case it’s passed you by, is a kind of Xfactor for professional and/or amateur artists. It’s complusive viewing though and I try to ignore it or record it and watch it later instead of frittering away half the morning or eating my meusli ridiculously slowly. Lots of cringing ensues. Anyway it’s on at 8.15 BBC2, must be coming to an end soon. Right, managed to get a painting done and am off to play shops again this afternoon…………wish me luck. This little stem fell from the hyacinths I was painting the other day so I thought I would pay tribute. It had to be a quick one as I have been shop-keeping today at the Made In Northamtponshire shop which was fun. Whoever let me loose on that till was very brave! Yeah, I know. A bit of a daff-fest. Well they did cost a whole pound so I need to make use of them. They’re beginning to fade now. Hoorah do I hear? Daffs 2 has had a bit of a re-jig and will be back tomorrow! Oh no. Beats apples. It’s good to be back in the studio today after half-term. A lovely few days spent in Kirkby Lonsdale and then friends coming to stay for a good catch up was fun. Now it’s onwards and upwards with spring flowers shooting up all over the place and a couple of commissions to complete. Last Friday saw the private view/launch of a new gallery in Brackley called Indigo where I have some of my daily paintings. It’s worth a visit if you are in the area. It used to be Rowan’s (in the Market House Courtyard) but has been taken over and revamped with a lovely fresh and relaxed feel. The snow is on it’s way back apparently so I’m bedding down for the weekend. I’ve got a large painting on the go and I have to give the subject matter back to the owner soon (a chair) so need to crack on! It’s half-term for us next week so off to Kirkby Lonsdale to see family and hopefully getout and do some painting. Will take mypaints but, somehow it never quite happens.